Choose resistant varieties, which are widely available. Measures that reduce aphid populations will cut the risk of CMV and other viral diseases in the garden. Grow plenty of nectar-producing flowers to attract aphid predators including ladybeetles, lacewings and hover flies. 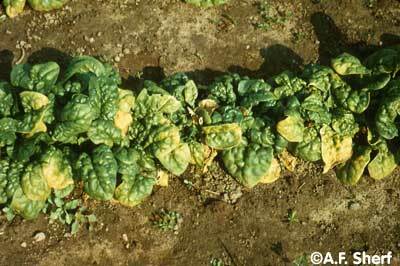 If viral diseases are common in your garden, use row covers (garden fleece) to protect young spinach plants from aphids.